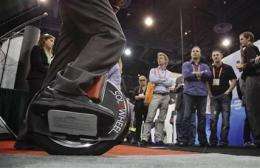 Weird gadgets at CES: Motorized unicycle, anyone? A motorized, seat-less unicycle, a video game you control with your eyes, and a mind-reading headset that serves as a game controller were among the more bizarre gadgets being shown off at this year's International Consumer Electronics Show. - SOLOWHEEL. Picture a unicycle without a frame or saddle, and you have the Solowheel. Not working for you? Ok, add this to the picture: footboards that fold out from the wheel. To ride it, you stand on the footboards and straddle the wheel. Lean forward, and the wheel engages a battery-powered electric motor that can send it -and hopefully its rider- zooming along at 10 miles per hour. The wheel has a gyroscope that helps keep the rider upright. In other words, it's like a Segway with only one wheel. Because of the rechargeable battery, which has a 15- to 20-mile range, the Solowheel weighs 26 pounds. That's as much as a folding bike, but the Solowheel is more compact. It's sold by Inventist LLC for $1,800. Its creator is a serial inventor, Shane Chen, previously came up with the AquaSkipper, a human-powered hydrofoil. Who's it for? Brave people with a good sense of balance, who want to utterly surprise everyone they meet. - FOAM FIGHTERS. Toy companies are eager to link their products with smartphone and tablet games, creating toys that are an amusing blend of virtual and real. Foam Fighters are made of two sheets of thin foam, painted and shaped like World War II fighter planes such as the famous Mitsubishi Zero. Toss them in the air, and they fly like paper airplanes. Better yet, you can attach them to a plastic arm with a suction cup that, in turn, sticks to the back of an iPhone, iPad or Android phone, right next to the camera. The airplane shows up on screen, and if you download a free app, the fighter plane will look like it's zooming around in war-torn skies, controlled by the movement of the phone or tablet. Foam Fighters go on sale in April. A pack of two, with a stand, will cost $10. Who's it for: AppGear is aiming at kids, ages 8 to 12, but it could appeal to frustrated fighter pilots of all ages. - HAIER BRAIN WAVE. The Chinese appliance company brought this wireless mind-reading headset to the show, and demonstrated how it could be used to control a TV set. It holds one sensing pad to the wearer's forehead and another that clips onto an earlobe. The big limitation is that the mind-reading capability (actually just measurement of brain waves) is crude. The set can only be used to sense if the user wants something to go up or down. For any other direction, you need the remote. In a demonstration of a simple maze-like game, the wearer guided a figure up or down with his mind, and right and left with the remote. Haier said it's developing something that lets the wearer change channels by thinking about it. Haier is selling the set in China, but has no plans to bring it to market in the U.S.
Who's it for: No one outside of China, yet. Eventually, this could be a dream come true for the laziest of couch potatoes. - EYE ASTEROIDS - Continuing on the theme of controlling electronics without moving, Swedish company Tobii brought its eye-controlled arcade game to the show. To play, you stand in front of it and look at a screen, where asteroids hurtle toward your battle station. It shoots laser beams at the asteroids you look at, destroying them. So yes, looks can kill. The game cabinet contains cameras that track your gaze. The arcade game is really just a technology demonstration. What Tobii really wants is to have these gaze-tracking cameras built into laptops and other computers, so we can dispense with the mouse. But it does sell the game for $15,000. Who's it for: Arcade owners who want the latest. - SIGNA POWERTREKK - This New York company showed off an alternative to batteries: a fuel cell the size of a big sandwich, powered by small, light "pucks" of a silicon-based material that produces hydrogen when water is added. The fuel cell is expensive, at $200, but the pucks are cheap, at $12 for three. Each puck will produce the equivalent of six AA batteries of electricity. That means it can charge an iPhone twice, through the included cables. SiGNa will be selling the cell through outdoor retailer REI this spring. Who's it for: Campers, hermits and others who need to go a long time without electricity. That's a far cry better than those silly wheel shoes that go 2 miles and charge for 2 hours.